MSC Adams helps UNAM's FSAE team win Rookie of the Year! In 2010 the Universidad Nacional Autónoma de México made its debut in the Formula SAE category with very good results thanks to the big effort of the team members and to the sponsors of the team, including MSC Software. Since it was the first time that the team would build a car for this competition, we didn't have previous prototypes to base our design on. We managed to make a good design by investigating in books, the internet and visiting some of the teams that had already participated in FSAE, however once we had decided the first configurations for the systems, we were uncertain about how to decide if it was good enough to build. Thanks to the support of MSC Software we were able to use ADAMS to evaluate the configuration for the suspension and steering in our vehicle, we were able to simulate a lot of events in this software and finally got to a configuration that we were comfortable enough to build. In this first season we unfortunately didn't get enough time to physically test our car so we relied on the results we obtained in our computer evaluation to take our car to the competition. 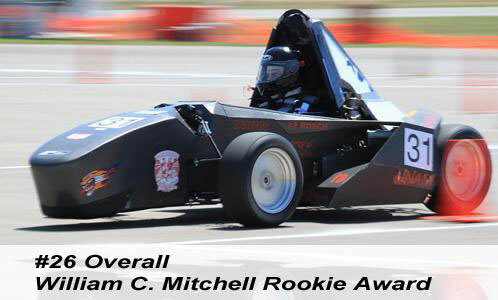 We had a good performance in the competition and ended up earning the "William C. Mitchel Rookie of the year" award in FSAE California 2010. Our suspension and steering systems behaved well, just as ADAMS helped us predict.